(SMITH, Goldwin). The Bystander. A Monthly Review of Current Events, Canadian and General. Vol. 1 January To December 1860; Vol. II January to June 1881; Vol. III January to October 1883. Toronto: Hunter Rose, 1880-1883. 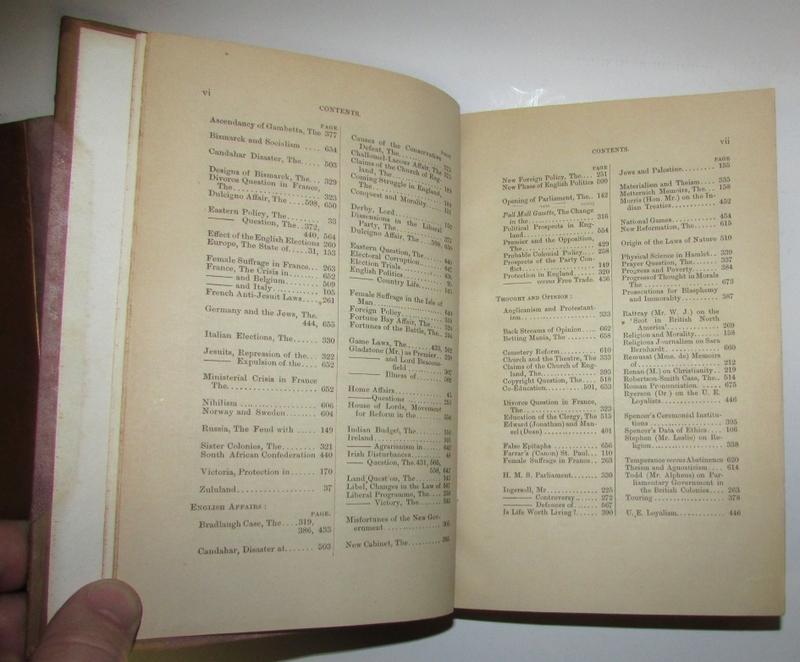 Complete in three volumes as publication was suspended from July 1881-Dec. 1882, 1884-1888. A fourth volume, New Series, was published Oct. 1889-Sept. 1890. Tall 8vo., contemporary half calf, cloth, raised bands, leather spine labels. Cloth mottled otherwise near fine. 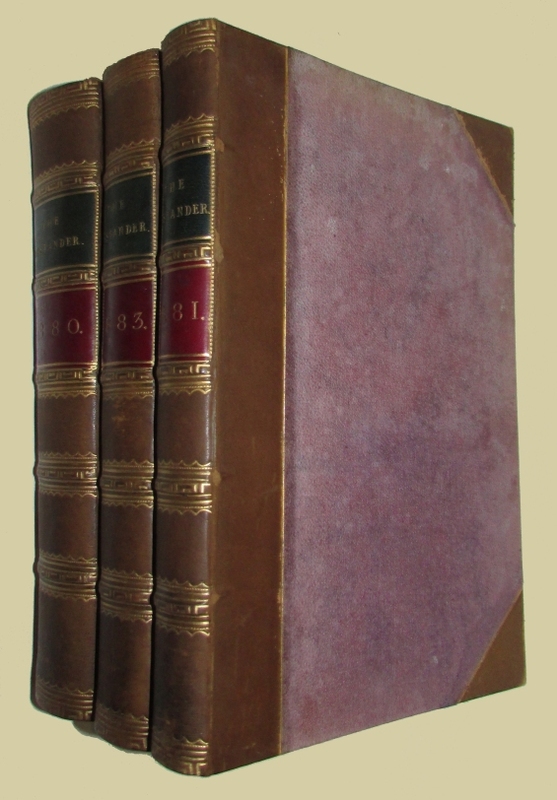 It is unusual to find the three volumes together. 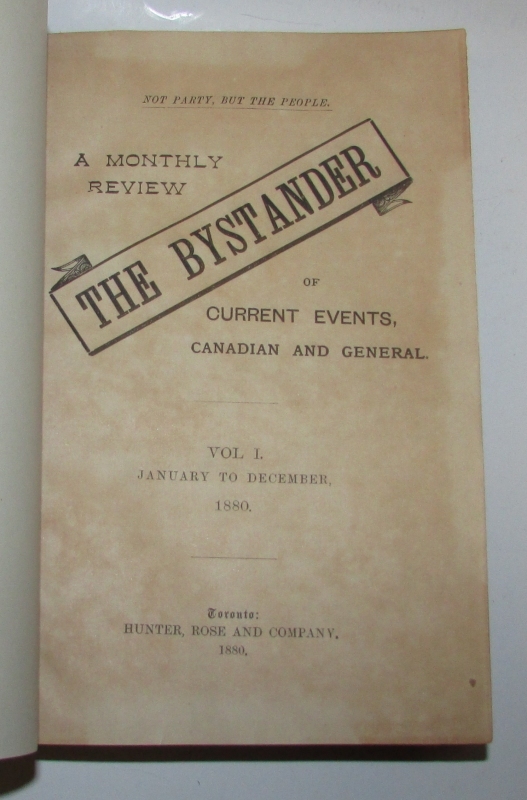 In his entry for Goldwin Smith in the DCB, Ramsay Cook states that this periodical was Smith's "own one-man show, The Bystander, subtitled 'A monthly review of current events, Canadian and general.' The performance was a breathtaking one. For three years Smith's outpourings filled its pages with brilliant, opinionated comment on virtually every political, cultural, and intellectual development in Europe and North America. He was determined to broaden the mental horizons of Canadians and by 1880 was pleased to admit that the great questions of religious philosophy are beginning to engage a good many Canadian minds. He expounded Adam Smith's political economy, denounced women's suffrage as a threat to the family, warned of the dangers of Herbert Spencer's social Darwinism, castigated Bismarck, expatiated on the Eastern Question, and sniped at Disraeli. He even found space, when Sarah Bernhardt visited Canada in 1881, to agree with Bishop Édouard-Charles Fabre and the Presbyterian (Montreal) in condemning her for her unsanctified liaisons. The Bystander's suspicious eye frequently detected clerical power in Quebec and Ireland, and Jewish control over the European press. When Smith decided to give his active pen a rest in June 1881, he had established himself as a vigorous intellectual voice in Canada. A second series of the Bystander, this time published quarterly from January to October 1883, began after his return from another lengthy stay in England."